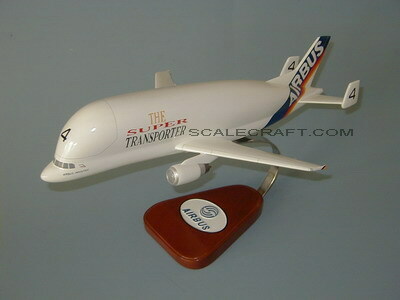 The Airbus A300-600ST (Super Transporter) or Beluga is a version of the standard A300-600 wide-body airliner modified to carry aircraft parts and over-sized or awkward cargo. It was officially called the Super Transporter at first, but the name Beluga became popular and has now been officially adopted. Mahogany wood. Wingspan 13 1/2 inches, length 17 1/2 inches.